Normally referred to as a Germanic tribe, by the first century BC the Sitones were a relatively small group that was occupying relatively uncertain territory, probably in Scandinavia if Tacitus is to be understood accurately. 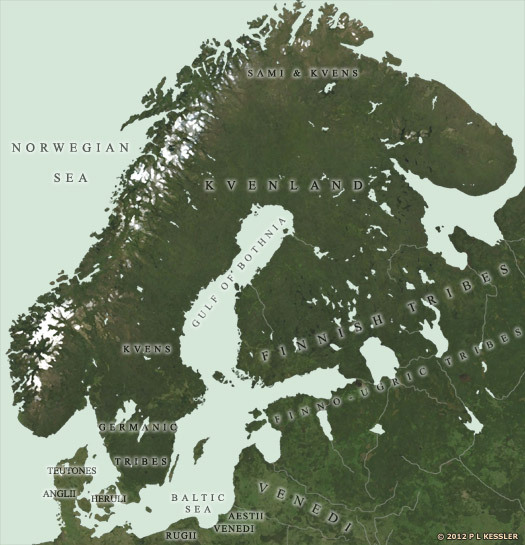 They would have been neighboured by the early Swedes to the south and the Kvens to the north. The Sitones' tribal name is a very simple one to break down. Removing the Germanic plural, '-on', and also the Latin '-es' plural leaves the core word, 'sit', meaning 'settlers'. The tribe were 'the settlers'. It suggests that they had found their home on what seems to have been the border between fellow Germanics to the south and the 'foreign' Kvens to the north, and had no plans to migrate anywhere. In fact the name may have been more a statement of intent than anything, perhaps in the face of Kven resistance to their settlement. The Sitones (or Sithones) formed one of the minor constituent tribes of the vast Suevi confederation in the first century AD. Their existence was recorded only by Tacitus, who mentioned that they had a woman as a ruler. While this may not seem entirely unusual in itself, Saxo Grammaticus in his Gesta Danorum (History of the Danes) wrote that a German maxim is that it is shameful to be ruled by a woman. This is evidence that the Sitones were not originally German. More probably, they were Celts who had either gained a German ruling class or who had simply succumbed to the inevitable, and in a world that was becoming increasingly dominated by Germanic tribes to the east of the Rhine, they fitted in and became Germanic in dress and eventually language. The other alternative is that they were Kvens. Tacitus seems to support this with his positioning of them alongside the early Swedes and by his claim that they were ruled by a woman. Clearly they practise the same form of matrilineal descent as the later Picts of northern Britain. Writing around this time, the Roman writer Tacitus mentions the Suevi, listing their constituent tribes which cover the larger part of Germania. Clearly in the century and-a-half since their first appearance on the Rhine they have expanded considerably. Noted for their custom of twisting their hair and binding it up in a knot (called the Suebian knot), they comprise the Langobards, the Semnones ('oldest and noblest of the Suebi'), 'the seven tribes of Jutland and Holstein': the Angles, Aviones, Eudoses, Nuitones, Reudigni, Suardones, and Warini, then the Hermunduri on the Elbe, three tribes along the Danube, Marcomanni, Naristi, and Quadi, followed by the Buri and Marsigni. Then there is a mountain range that separates part of the Suebi, beyond which, along the Vistula, are the constituent tribes of the Lugii, the Harii, Helisii, Helveconae, Manimi, and Naharvali. Then come the Cotini (or Gotini, as Tacitus calls them), Gutones (clearly the Cotini again, although perhaps a separate division of them), Lemovii, and Rugii along the Baltic Sea, the various divisions of the Suiones (Swedes), and last but not least the non-Germanic Aestii, and beyond them the Sitones, both of which are on the Baltic coast.